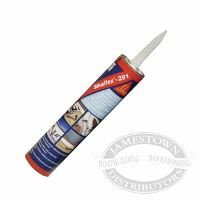 Sika 291 is a Professional grade Marine Adhesive/Sealant used by boat builders and yards to bond and bed boat components structurally. Fast strength build-up overnight. Use above and below the waterline. Comes with nozzle. All purpose adhesive sealant, bond to hull & structural members. Bedding Compound, light bonding, fast cure polyurethane sealant. NOTE: SIK-291201W is a 20oz. Sausage Pack, which is NOT compatible with standard caulking guns. Tack Free Time: 60 min. Rate of Cure: 1/4-in x 1/4-in bead 9 days at 40F/30% R.H.
1/4-in x 1/4-in bead 4 days at 73F/50% R.H.
1/4-in x 1/4-in bead 3 days at 73F/70% R.H.
1/4-in x 1/4-in bead 1 day at 100F/75% R.H.
Is sikaflex-291 applicable to sealing gap between fibreglass manhole & upvc pipe? Any other product reccommended for this sealing application? I assume what you want to do is seal this gap so no moisture can enter through the gap. As long as there is no movement and the gap is somewhere around 1/4&quot; or less this product should work well. Yes it should work great and it is paintable. What do you use for clean-up? masking tape...seriously, the virtue of this material is that it will seal (stick to) just about anything. The best way to address the cleanup problem is to avoid having to clean up. how difficult is it to remove this product and does it remain flexible when cured ? Very easy to remove and yes it stays flexible. We have to re-do joints on our City Waterslide at the pool and this is the product we use because it is easy to work with and easy to remove. I did not try to remove it so cannot answer that question it is tough to remove from your hands so wear latex gloves. I found this to be a great product. It does stay flexible. I used it to repair long cracks in the bottom of my Coleman canoe. After the Sikaflex dried I went over that with construction adhesive to make the repair more durable. I have not had a leak since although you need to reapply the construction adhesive from time to time as it tends to start peeling off. It is very difficult to remove when cured. In fact, it's difficult to remove when still fresh. Remains flexible when cured, but requires a high shear load to see the flex. I've had no problem painting any Sikaflex product. Can this be used to seat and seal a forward deck window on a Hunter 295? Yes, that's what it's designed for. However, it's a 3 part process: you also have to purchase the activator and the primer solution and apply both to each surface prior to applying the 291 caulk which comes in black. I used this product to attach the plexi canopy of my plane to the canopy frame, thus eliminating rivets or screw fasteners thus reducing the possibility of stress cracks in the future. The plane is capable of 200 mph and I haven't lost the canopy (or my life) yet! Best of luck. If it has a metal frame, it should work fine. Don't know if it adheres to all plastic type materials.I used it to seal under rub rail on a '80 21 ft. Hammond Challenger. Still good after 5 yrs. Can this be used to seal hull seams in an old wooden boat? I am looking to seal the oily, problem areas lower and near the stern. I would use 5200 but I am looking for something less expensive and less permanent. sorry, I have no experience with wooden hulls. I don't think any of these sealants work well in an oily environment. Sikaflex is caulking, i.e. flexible to accommodate the wood planks swelling when immersed. I have used it on Beetle Cats to replace old fiber caulking, with good results. I have read that sealing seams tight before immersion can result in increasing the gaps, by preventing the wood planks from swelling. Pay attention to clean oil off any surface to ensure good adhesion. Is it OK to use on SS drinking water tanks? Thanks a lot. I wouldn't be afraid to drink water now. According to their data sheet that I found online: &quot;NSF approved for potable water (black & white only)&quot;. And it will certainly stick well and seal. will sikaflex -291 bond to lexan? Sorry I have not used it yet. I used Sikaflex to bond the cabin windows in my Catalina sailboat to the fiberglass cabin. After a really good cleaning of the mating surfaces with MEK and masking were you don't want the product it went together easy and cured overnight. It is tough, waterproof, UV resistant. The best thing is cleans up really easy with Isopropyl alcohol. It is a standard practice to bond the canopy to the frames on homebuilt aircraft using this product. Sealant for wood hull to install thru the hull depth finder? My experience with Sikiflex has always been good. I'd use it again. Sorry, I was in a hurry typing the last answer. Sikaflex makes quite a number of different formulations for different requirements. The 552 has a high shear strength, does not sag and does a really good job filling gaps and sanding. Use Sikaflex 552! It is expensive, but does a really good job as a structural sealant. I used it on all my thruhulls. Yes, Sikaflex 291 is a good sealant for a thru hull. I wish JD offered the option of shaking the paints they sell. Used this on underwater seams where the plank ends meet the transom. Really good adhesion, very flexible. I'll use this wherever I used to use Life- Caulk, much better. I fully recommend this for bedding fixtures and hardware also. Good stuff! Great for sealing deck fuel hatches. On ordering these items, I have always ordered white from every vendor. When I ordered these I made sure I noted white as color of choice. When I got order they were black in color. Product was coded incorrectly and now I have a case of a product I cant use. Was not packaged well by Jamestown , almost not usable!!! Use this sealant to install thru hulls and seacocks. If it's good enough for Marshall Marine. This stuff is fantastic. Fairly priced and very effective. It sticks and ages very well. I use it mostly for betting deck hardware. I use it for trim around any hardware I put on my boat as well as over the bolts to keep down saltwater corrosion.